My original reason for purchasing CC 3 was the ability to reduce polygon count on characters, making it much easier to have larger numbers in shot. I am loading old CC 2 figures to play around with this, but 'Polygon Reduction-Oject' and 'Polygon Reduction-Element' are greyed out? Also I keep being told I need the Export License to modify my character. I have no trouble paying an extra $50 or so to upgrade, if that is what is really needed, but paying another $200 just to be able to modify polygon count on a character seems a bit much. I have no interest in games and do not wish to export to any program other than IClone? Am I missing something?.. Homebuilt computer - Windows10, i5-4430 CPU @ 3.00GHz, Nvidia GT1080ti Graphics, 32GB DDR3 RAM, AusRock Fatality H87 motherboard, 5 terabytes of disk space, 28” monitor and Optoma HD25-LV projector. if that is what is really needed, but paying another $200 just to be able to modify polygon count on a character seems a bit much. I have no interest in games and do not wish to export to any program other than IClone? That's the most annoying thing about the LOD PlugIN. which one has done with the help of RL-Kleidung and has no export license to !! It is denied the creation of such avatars with reference to the missing export license. and clothing the oer obj file was imported. Maybe RL has meant that anyone who buys CC 3 pipeline only wants to make the player's position or the creation of images via IRay. That you also want to make polyreduzierte avatars in IClone 7, was probably not so much in focus. You can reduce your character by converting to game bone. It will still work with all the morphs. Here are the (most) avatars only 5000 polygons in size. I just do not know why that nobody seems to want or understand. Hi Postfrosch… Please be assured your feedback regarding requiring export licenses when sending to iClone is being reviewed. I will update again when I know more. Well, to add another voice, I also have no interest in game export, and I also was under the impression that reduced poly-count characters would be usable in iClone. So clarification would be most welcome. Hi Postfrosch… Thanks for sharing your concerns with us. I will pass on your feedback to the CC3 team. Once I know more I will update again. refuses the LOD plugin with a reference to the non-existent export license. 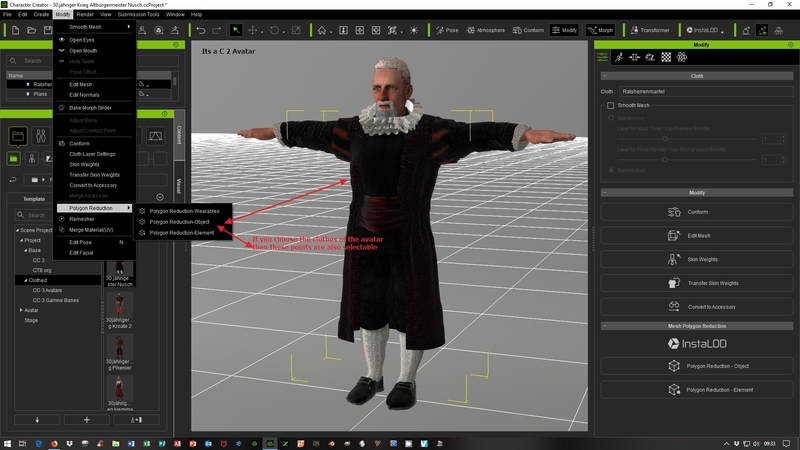 To reduce my avatars I made on the basis of RL Bases (Assassins etc) via LOD PlugIn (eg: 5000 Polys) I now need the export license, although the reduced avatar does not leave the RL system (from RL CC3 to RL Iclone 7 VIA fbx and 3dx7). I think that you should sort it out somehow. FT ticket 5160 asks for this feature, which was also my main reason to buy the pipeline version. If you haven't voted yet, pls, cast a vote for it. Long time ago Peter already confirmed that they are going to work on it, but unfortunately we do not have a precise schedule yet. Hope RL is going to put enough focus on it.